Takeaway: While hydroponic strawberries are not an uncommon crop and are relatively easy to grow, hydroponic blueberries, cranberries, and raspberries can also be produced on a limited scale with soilless greenhouse cultivation. However, growing ripe, fresh berries brimming with flavor is one of the most exciting challenges of indoor gardening. Find out how to get yours started so you can soon eat them straight off the plant. The trick to successful indoor berry crops is understanding the physiology and natural life cycle of the plant so that flowering, pollination, and fruiting all go according to plan. While hydroponic strawberries are not an uncommon crop and relatively easy to grow, other berry crops require a little more investment in time and effort. However, they are highly rewarding. Hydroponic blueberries, cranberries, and raspberries can all be produced on a limited scale with soilless greenhouse cultivation—many in high tunnels to extend the harvest season and improve fruit quality—but they can also be grown indoors. For those new to berry production, strawberries are the ideal crop with which to gain some experience. The plants are readily available, small, compact, and available in a range of different fruiting types and cultivars that produce fruit relatively quickly. Strawberry varieties fall roughly into two different categories: the short-day and day-neutral types. Most of the outdoor strawberry types are short-day varieties. These initiate flowers under the shorter day lengths (less then 14 hours) and cool conditions of winter in temperate climates. They then flower and fruit as temperatures warm up in spring. Day-neutral varieties are often used by greenhouse and hydroponic producers, as they can be manipulated to crop out of season if sufficient warmth and light is provided. Day-neutral strawberry varieties are given an artificial “chilling” period to initiate flower and then induced to flower and fruit with warmer temperatures. Hydroponic growers can buy chilled runners or plugs (called “frigo” or “pre-conditioned” plants), which have had a period of four to eight weeks under refrigeration (34-37°F). Or, growers may chill their own stock by wrapping the clean runners or small plants in damp paper and plastic, and placing them in a refrigerator for four to six weeks. Either way, the artificial chilling replicates the cold conditions of winter, which is especially great for those in tropical locations or where winters are very mild. Once planted out into the warmth and light, the plants resume their spring growth pattern of foliage development. They flower relatively quickly, followed by fruiting. While pre-conditioned runners or plugs are available almost year-round in some regions, this type of planting stock is raised pretty much exclusively for outdoor gardeners and thus are often only available in spring. Indoor growers therefore may need to consider raising their own planting stock if they want to produce berries out of season. 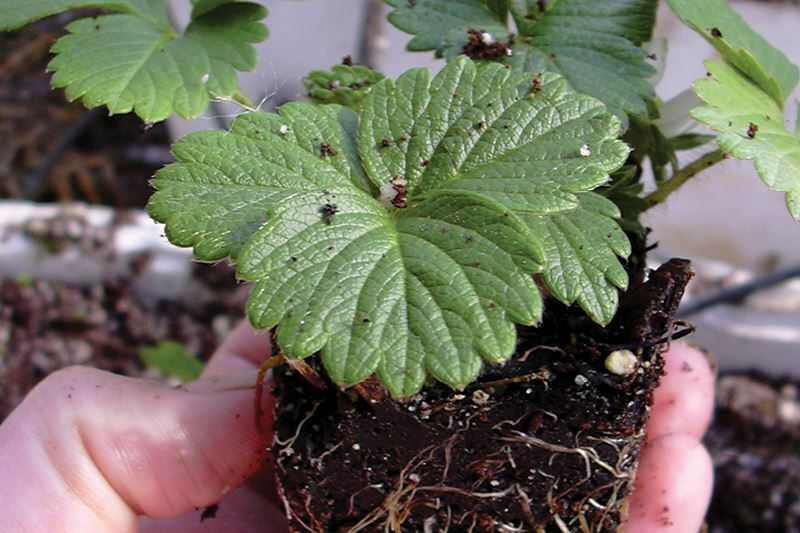 Strawberry plants are relatively easy to propagate from runners produced at the end of the fruiting season, and there has been a recent development of large fruited types that can be raised from seed. 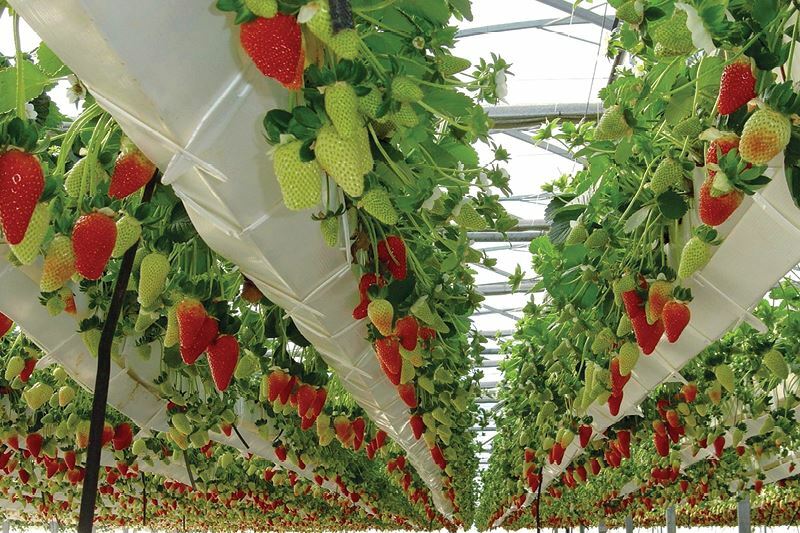 Hydroponic systems for strawberry production are diverse. With a suitable, high intensity lighting set-up, strawberries can be grown in vertical stacks or towers, which make an impressive display when in fruit. However, care needs to be taken on the lower levels of vertical systems, where light and air flow are often restricted, resulting in lower yields and increased occurrence of fungal pathogens. The strawberry plant is particularly sensitive to moisture and crown/root rot is the number one cause of strawberry plant deaths. Beginners are advised to try their first strawberry crop in a free-draining, media-based system, such as perlite or a 50/50 coconut fiber/perlite combination. Even rockwool cubes can work, provided they are well-drained. This way, the plant can be easily positioned with the crown just above the surface of the media. Drip irrigation systems are preferred, as ebb and flow can cause salt buildup around the crown, which also leads to problems. Strawberries can be grown well in nutrient film technique (NFT), aeroponics, and various modifications on these systems, but plants need to be well supported so they don’t slip down into the nutrient flow. Only clean plants—i.e. not those coming from soil—should be used so that root rot pathogens are not introduced into the system. Solution warming is useful at 68°F, particularly when starting new plants that have recently been given a chilling treatment. The recommended EC levels for hydroponic strawberries vary depending on the environmental conditions and growing system. EC levels in NFT are recommended to be between 1.4-1.8 mS cm-1, while levels of 1.4 - 3.0 are more common for those in media. A minimum EC of 1.8 is necessary during the harvest period to maintain good fruit quality from all systems. Running EC and potassium levels at moderately high levels is one way of concentrating both sugars (brix levels) and the aromatic volatiles that contribute to the distinctive strawberry flavor and aroma. One of the main considerations when growing strawberries and other berry crops hydroponically is pollination; outdoors, this is carried out by bees, other insects, and the wind. Indoors growers can manually pollinate strawberry flowers with a small hair dryer on a cold setting directed at each individual flower, or by gently brushing the inside of each open flower with a small brush. Hand pollination needs to be carried out every day immediately after the first flowers open to ensure good fruit set as the pollen only remains viable for two to three days after the flowers open. Blueberries, cranberries, and raspberries are less commonly grown in a hydroponic set-up than strawberries; however, they are suited to soilless production and benefit from the protected environment of an indoor garden. Cranberries are naturally a bog plant with long, trailing stems bearing fruit. For this reason, they are ideally grown in an elevated system, three to four feet above the floor, were the stems can trail directly downwards. Dwarf blueberry cultivars, which have been bred to grow in containers, are now widely available and can produce high yields of good quality fruit. Dwarf varieties grow to around two to three feet in height and can be pruned to control size. For those with limited space, dwarf blueberries are the most suitable crop as raspberry canes require more vertical space to develop and leaf out. Raspberry canes grow upright. They are tied into place with fruit-bearing stems trained into position and pruned to keep the canopy open for air movement and disease prevention. Raspberries are categorized into two main types: primocane (fall bearing or everbearing types) and floricane (summer bearing). For hydroponics, primocane types are recommended, as these produce fruits at the top of first-year canes over a long harvest season. They also require less growing space and support than floricane types. 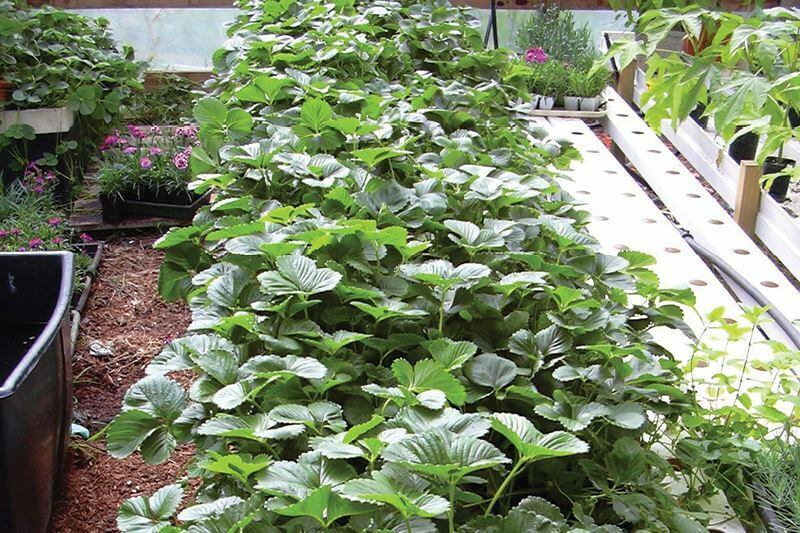 As with strawberry plants, these berry crops are more suited to containerized, drip-fed, substrate-based hydroponic systems. This is both to ensure over-saturation of the root system does not occur, and to facilitate the ability to move the plants when they require chilling or become too large for the space available. Berry crops don’t require high levels of heat and will grow in similar conditions as many other fruiting plants. Temperatures of 72-74°F during the day and 68-70°F at night are ideal. For maximum fruit quality and sugar levels, the light requirements are similar those of tomatoes and capsicum, and plants benefit from a long day length to push up the daily light integral. Nutrition for all berry crops is similar. A well-balanced vegetative formulation is required in the early stages after initial bud break, followed by a bloom or fruiting formulation that is high in potassium once fruit set has occurred. For acid-loving blueberries and cranberries, pH levels can be run somewhat lower than other crops, around 5.0-5.5. However, they will still grow well in mixed crop systems where pH is maintained at normal levels of 5.8-5.9. With all three crops, the cycle of flowering and fruiting is triggered by environmental conditions. Like strawberries, chilling is required during the plant dormancy phase to initiate the flowers for a good level of fruiting. For smaller indoor gardeners, the simplest methods of providing chilling for berry crops is to move the containerized plants outdoors in winter. Dormancy occurs during this time, so the plants don’t require nutrients and only a minimal amount of water. The number of chilling hours required by berry plants is somewhat dependant on species and cultivar; however, raspberries and blackberries usually need 200-800 hours below 45°F and blueberry plants 500-600 hours below 45°F. Some “low chill” varieties can need 200 or less chill hours). There are also several “low chill” varieties of berry plants developed for warmer areas and these need 200 or less chill hours (these are also ideally suited to indoor growing). Nurseries often list the number of chill hours required for each variety they sell. Once the chilling requirement has been met, plants can be moved back into the indoor garden where warmth and light will bring them into active growth long before outdoor crops have started to stir. As a result, flowering and fruiting should occur much earlier in the indoor garden. Also, berries that are protected from birds, insects, and the elements also tend to be larger, of excellent quality, and high-yielding. Another important aspect of indoor berry growing is the requirement for pollination assistance. As with strawberries, these blueberry, cranberry, and raspberry flowers require pollination to set fruit. Greenhouse growers can purchase small portable hives of bees to carry out pollination, but a small indoor garden will require manual pollination. With blueberries, it can be an advantage to have two different cultivars and to cross pollinate between these. Harvesting of berries is one of the most rewarding tasks of an indoor hydroponic garden. Ideally berries should be left to fully ripen and color on the plant before harvest. This ensures the full flavour profile and aroma have developed. Perfectly ripe berries are soft and fragile, raspberries need careful handling and should be eaten as soon as possible after harvest. Hydroponic berry cropping indoors has become a somewhat new trend, made more feasible by the development of dwarf, compact cultivars and varieties with low chill requirements. While strawberries may be the simplest for new growers to master, the more challenging blueberries, raspberries, and cranberries should not be overlooked as indoor fruit, if grown well, can be highly productive and a real taste sensation.